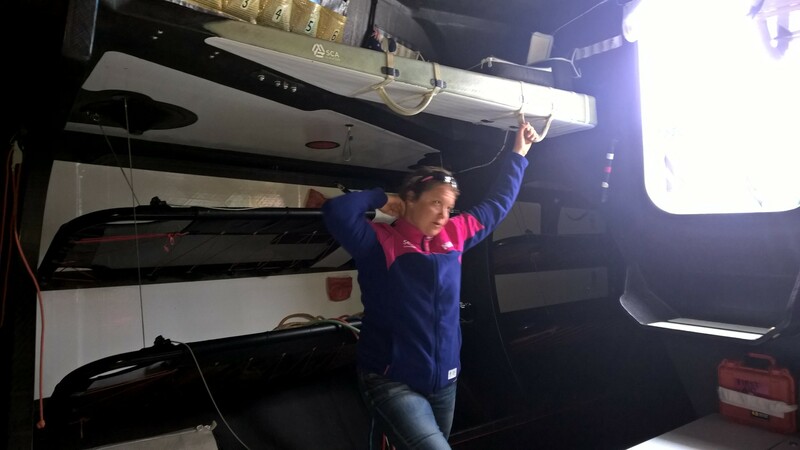 With all the racing over, the boats were going to be opened to the public and we had a plan of action to make sure we would get onboard Team SCA. 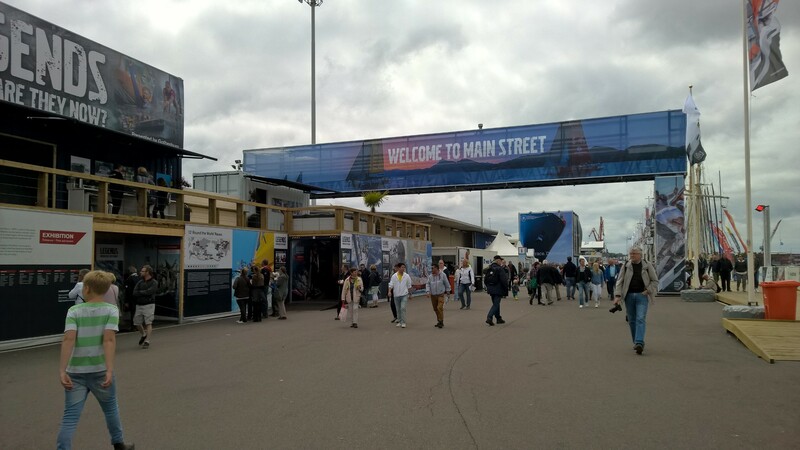 So we got the ferry over at 0830 over to the Race village and there was no security – so we were practically the first in the village and first in the queue for visiting the boats. Several people tried to queue jump and Mags gave them her fiercest teacher’s stare and some firm advice as to where the back of the queue was. (Please note that no children were harmed in this process – though some came close!). 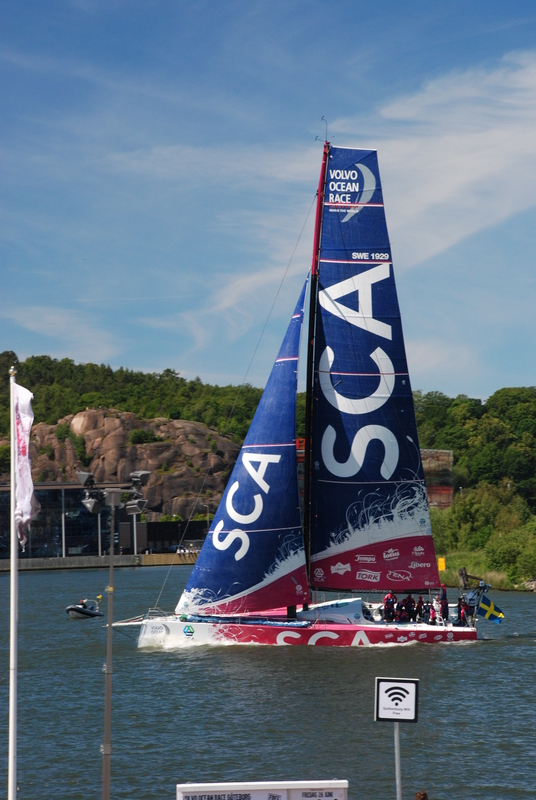 We were first onto Team SCA – which was great because we actually got longer than other groups and it was before they were jaded. It was very well done with each boat having 5 on at a time and a member of the crew. Sally (who was a driver, trimmer and tactician for the in port races ) was our guide and we asked her lots of questions. 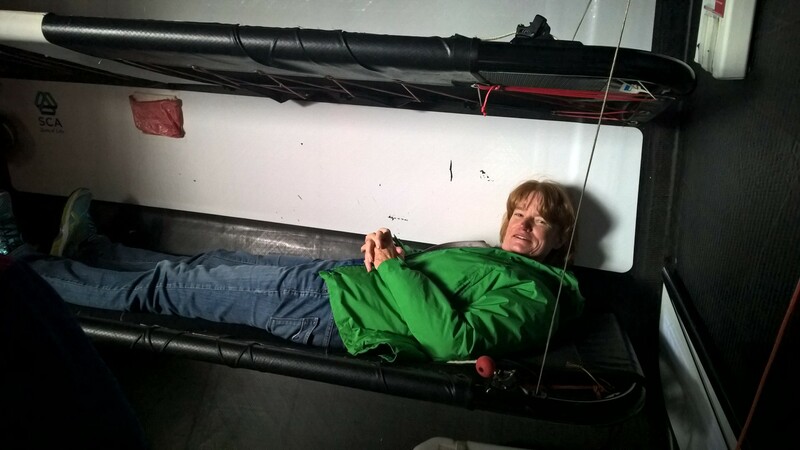 She explained the workings of the deck and the winches. The size of the winches and the weight of the sail packs that they regularly moved makes you realise how physical the race must be. Then she took us down below. The first thing you notice is how dark it is down below as all the surfaces are the matt black of the carbon fibre that it is constructed from and then the smell…. Even though it has been scrubbed. 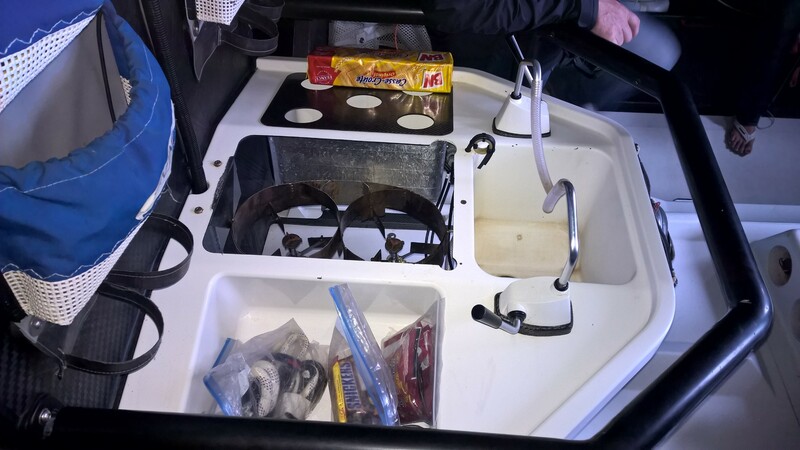 Below is a mixture of the very high tech electronics and very basic systems, all of which are exposed for easy maintenance. 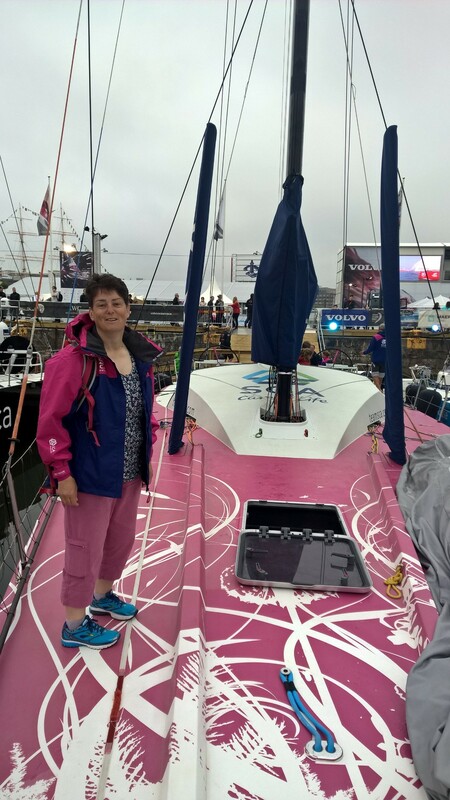 Being on board was such a highlight and we are still buzzing from the experience. Today was our day to explore the village which is very well laid out and it is clear by its construction it is a very slick operation as it is designed to be moved easily from port to port. The containers give you a clue as to how it packs down, even the race helicopter fits into one. The village had 3 excellent exhibitions. One is about the legends of former races and where are they today and it tells the story of all former boats and all the crews. I have had 2 friends that have done the Whitbread as it was called then and it was great to see their names up: Sarah Davies and Nick Bate. The second was a dome with different films showing about the history of the race. Originally there were supposed to be 8 teams and so 8 boats were made but the 8th failed to raise all the sponsorship necessary to enter so they have cut one boat in half from bow to stern and so you can see all the systems, which is fascinating. All too soon it was time to leave the Race Village – we felt sad to leave as we had followed the highs and lows of the team ( from the comfort of our house) culminating with being part of their final stop over. 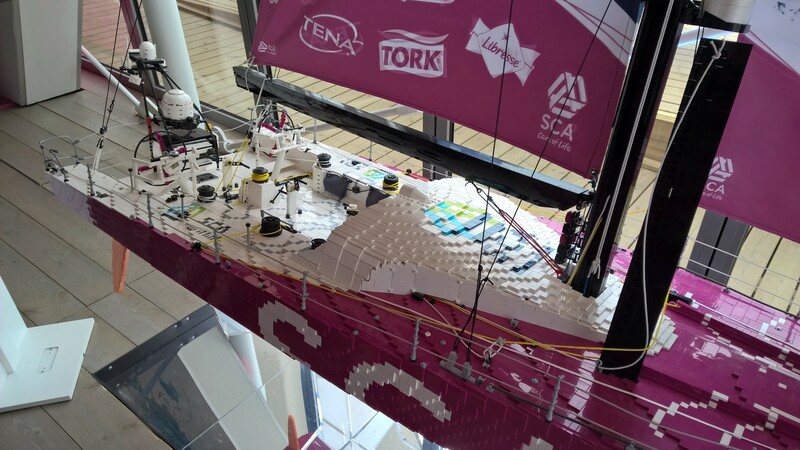 I cant begin to imagine what it must be like for Team SCA when they leave on the 1st July having been together for 2 years and having completed such a challenging race……… I just hope there are women in the next VOR. Bizarrely the ferry didn’t start running til an hour after the village opened and more importantly it would mean that we would miss the crew parade to the boats. 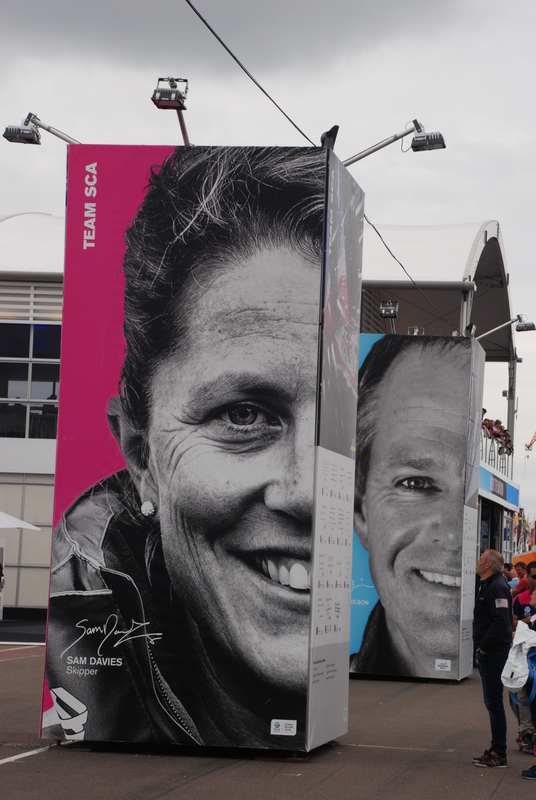 So we went in via the main entrance – and bumped into the Crown Princess Victoria of Sweden and Godmother to Team SCA’s boat….. good to see that we aren’t the only ones to have a boat Godmother! A quick stop at the SCA stand and we picked up some more Team SCA freebie’s this time some sun visors. It was clear that today there were going to be a lot more people and the crowds were definitely turning more magenta. The Team SCA shop was doing a roaring trade which at one point meant they had to have a queue just to get into the shop. 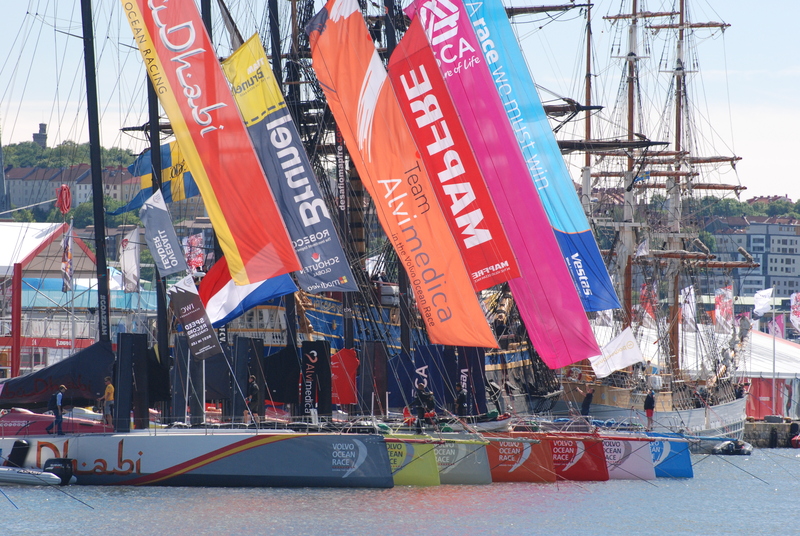 We found a place opposite the boats and waited for the crew to arrive in the team parade. By now the crowds so several people deep, I happened to be standing next to a friend of Libby’s which was nice to get a bit more detail about the behind the scenes activities. 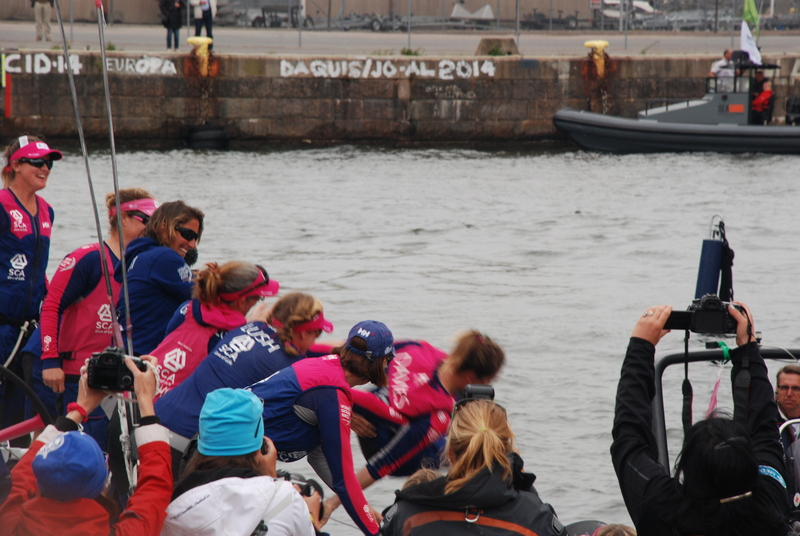 The crew arrived, Kyle – Carolijn son had clearly become accustomed to the crowds and was happily waving at everyone! 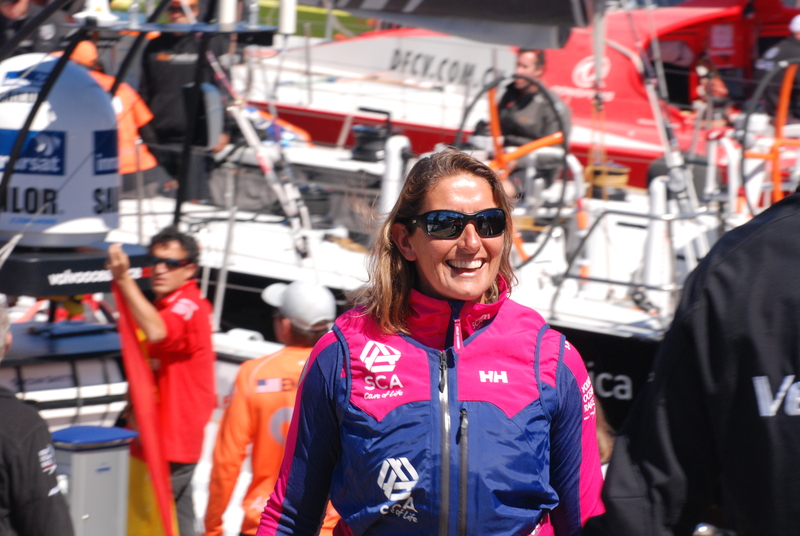 The crews had a few additions to their ranks: Mapfre had the former Juan Carlos King of Spain and Team SCA Princess Victoria and her body guards. 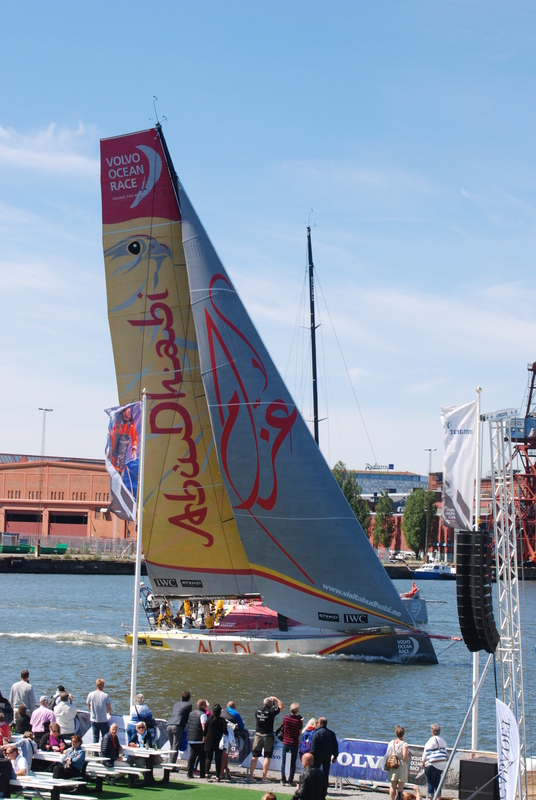 Once on board, boats left in order to their boat songs and we headed down to find a place on the grandstand. At the beginning of the day it looked like there would be no race, as only 4 knots of wind had been predicted – but despite it being incredible light there was enough wind to get the boats moving. The boats sailed passed the stand and Brunel did a crowd pleasing sail past but most motored to further down river to put up their sails. 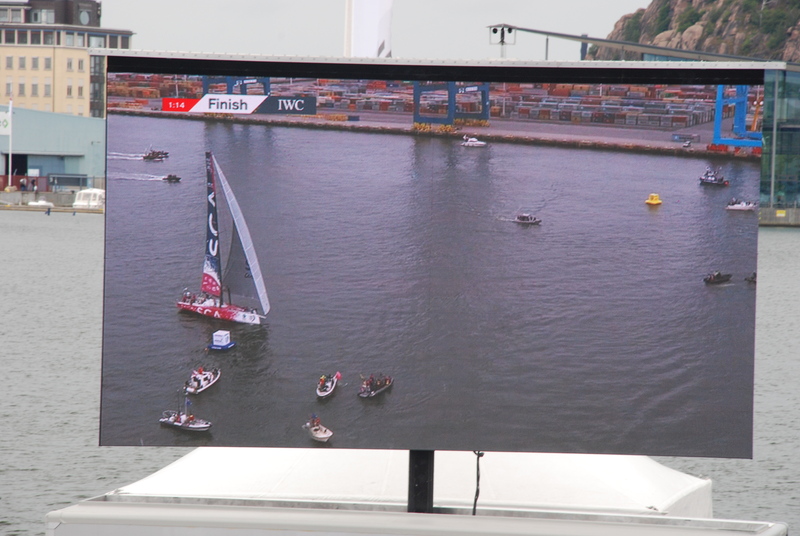 The race was electric and we watched it over the large screen as the race course was further out into the harbour. 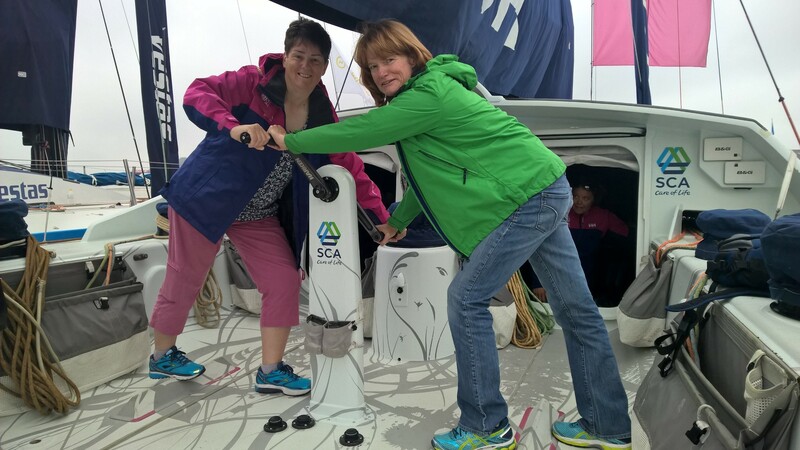 Every time SCA did a great move- be it the start or rounding a mark the magenta crowd roared with appreciation. At one point Liz was up the mast trying to flick the top battens over as they were bent the wrong way and you could feel the crowd pushing with her. By the last leg Brunel had secured a comfortable lead followed by Team SCA and then Mapfre gave Alvimedic a lesson in match racing. The sea of Magenta went wild when the girls secure a magnificent second place which saw them climb onto the podium for a third place in the overall in port race series. Each boat docked in reverse order of the overall results with their boat song blasting away. 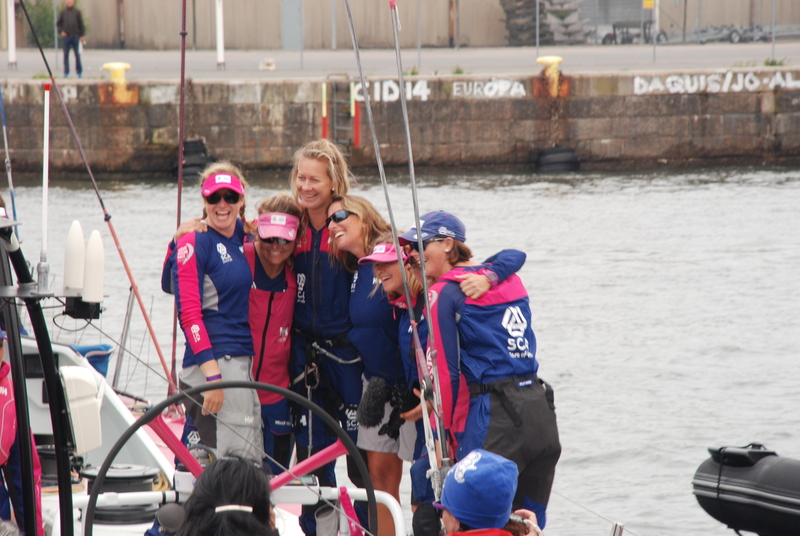 The girls looked (deservedly) ecstatic and there were lots of group hugs having completed the VOR. Once docked Dee, Sara, Libby and Elodie grabbed Sam the Skipper and threw her into the Harbour – at which point Sam started doing synchronised swimming (apparently a sport from her school days) to the rest of ‘Wake me Up when it’s all over’ their boat theme tune. 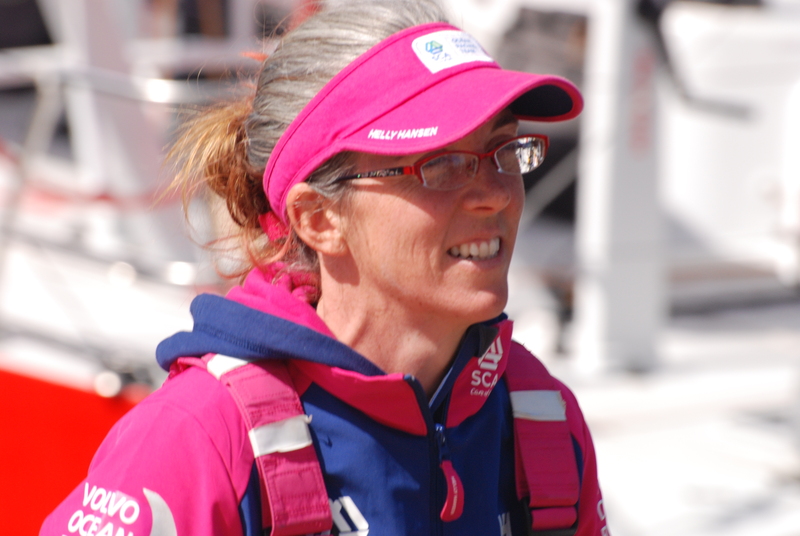 She was lifted out of the water and was interviewed by the Race Village MC Jo Pickard. We beetled our way thought the crowd and found a spot near the presentation stage – close enough to be able to see some action but safe enough from the champagne that gets liberally sprayed for each prize. 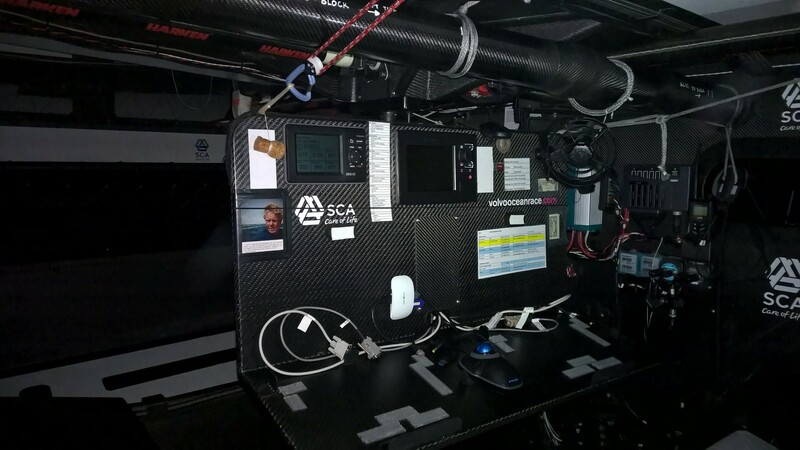 Team SCA were up twice – once for the second place in the in Port Race and once for the Magnus Olsson Award for their win of leg 8 in recognition of his favorite saying – Never Give Up – and they were worthy winners. Dinner was far more successful and we discover a fantastic restaurant – and we treated ourselves to the tasting menu – 8 courses later we rolled home not able to eat another mouthful. 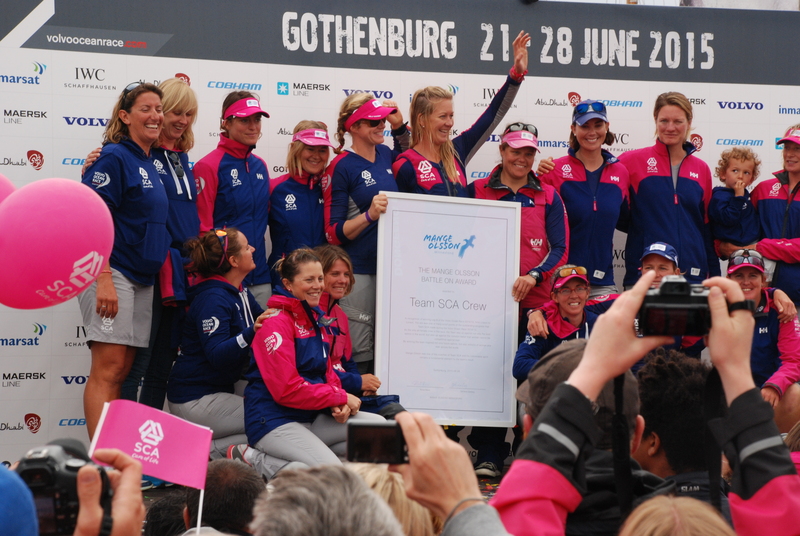 Ok so not strictly our adventures in Carra – but it was in Sweden and was very boaty – so in our minds that counts…..
From the moment we stepped off the plane in Gothenburg, it was clear that the weekend was going to be a magenta (not pink) one as we were greeting by a 5m tall picture of Abby from Team SCA. We detoured via the hotel which was a converted ship, to leave our luggage before getting the ferry across the river to Race Village. Both of us felt excited to be seeing the boats for real as opposed on a computer screen, as we had been following the race every morning and night for the last 9 months. 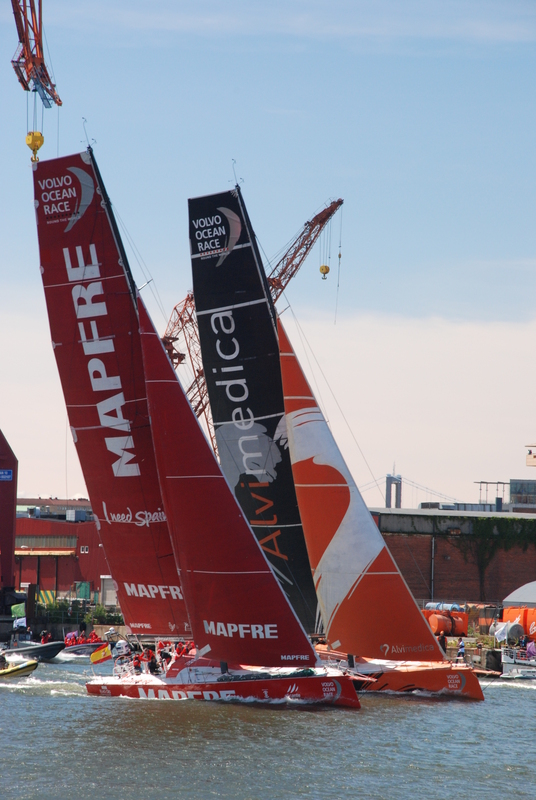 All seven identical boats were lined up in order of finish in the Volvo Ocean Race (VOR). Soon the shore crew arrived and off came the mail sail cover revealing the massive mainsail whose worn and faded appearance gave a hint of the 40000 miles it had seen to this point. Slowly the familiar faces of the crew came down to the dock, having seen them every day for months you felt you knew them – albeit in electronic stalker sort of way. 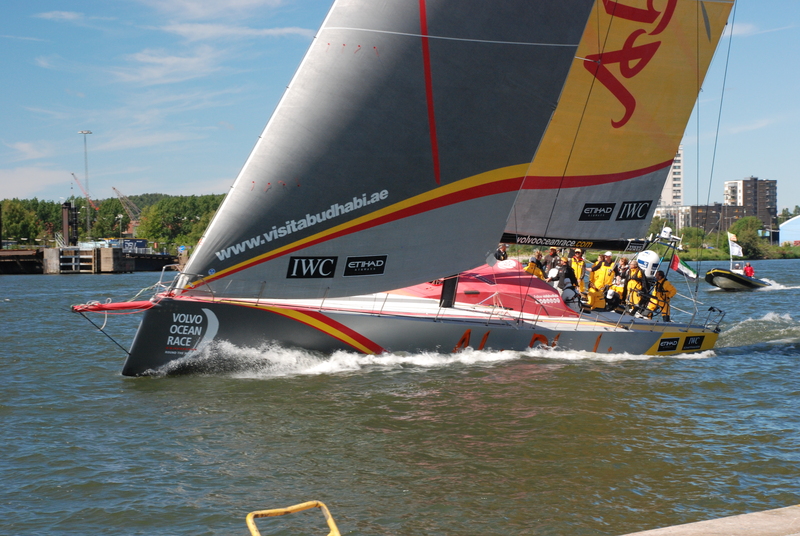 Today was the ProAm race in the river and with a good breeze and the sun shining – we were in for some spectacular sailing. They weren’t actually racing but sailing up and down the river alongside the Race village and from the grand stand we had a superb view. The footage on the computer gives you no idea how big these racing machines are – and in a relatively steady breeze of about 15 knots – these boats just accelerated through the water with their J1s set. Some were taking it easy with their J2 deployed. 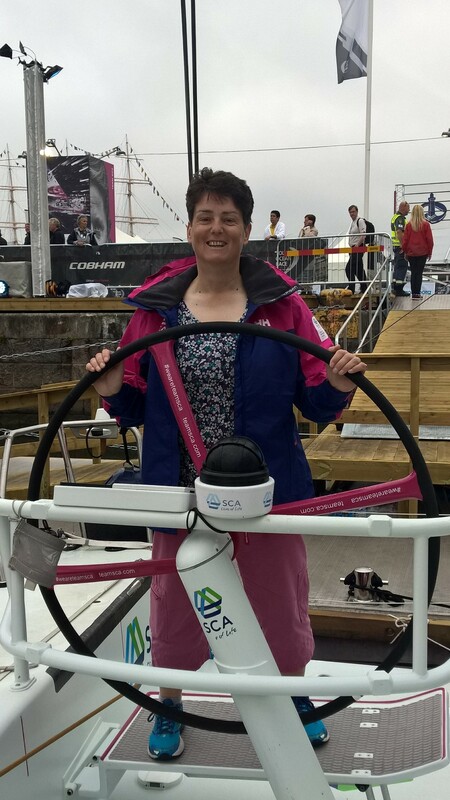 Whilst we were in the stand Mags was asked if she was part of the crew of Team SCA – when we were sailing round Britain she was asked if she was Ellen MacArthur…. Clearly there is something she is not telling me! After about an hour they returned to the dock and their very lucky guests left. 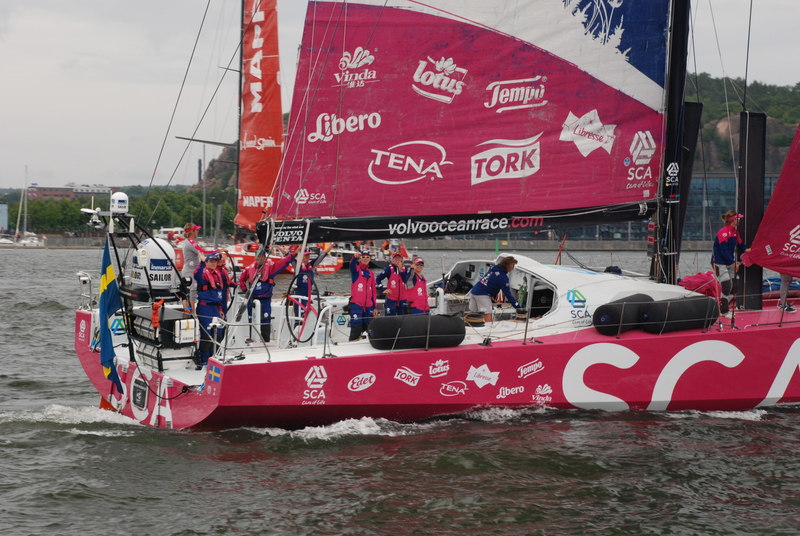 By now there was a definite magenta tinge to the village and it was clear that Team SCA where in their home port. Whilst you weren’t allowed on the dock, the boats were no more than 10m from the public walk way and with limited crowds because it wasn’t the weekend it was easy to get some good photos. We sussed out the village and Mags went on a mission to get various freebies for friends that weren’t able to attend: which included calendars, jigsaws, pins, flags, and stickers. Also we discovered the stand which had free ice cream- we were a frequent visitor to that one! Dinner was less successful, it ranks as the worse meal in terms of service we have ever had – having to wait 2 hours for our meal and given that the starter was nachos …. Needless to say I refused to pay the slightly discounted bill the head waiter offered us – and we left paying a lot less than they had the cheek to ask for.